Last night I was bombarded by strangers - and it always went like this, "Excuse me, are you the Bates Coach? How's your diver? She is amazing." I was so proud of Kelsey for so many reasons. By choosing to compete she sent all 500 athletes several positive messages. Toughness. 15 staples, a bathing cap, a board, and a pool. "I can do this." Not, "Why me... why my senior year?" Inspiration. After disaster strikes she competes to a 10th place finish. That's a top 10 performance in ALL OF DIVISION III Diving. Team. "I worked four years for this. This is what it is all about." Not many in this day an age say things like that after pulling a Greg Louganis. That mindset sent a clear message to me and her teammates. She wanted everyone to know that Kelsey Lamdin, and in turn, Coach Bartley and Bates Swimming and Diving, represent a program that never misses an opportunity to compete at your best, against the best. Times, standings, and place - sometimes that stuff doesn't matter. What does matter is competing. What does matter is giving it your all. She showed the nation that is what Bates is all about. A great coach once told me that most of the time winning battles is much more important than winning the war. I totally get it right now. Off to the pool to watch Katelyn and Charlotte enjoy their next races! WOW. That is one tough Bobcat! Tough ain't the word.... a true CHAMPION of the sport. 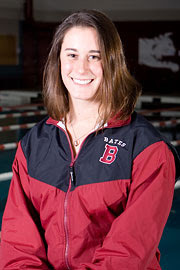 Congrats Kelsie on an amazinig career at Bates! You truly deserve a Blueberry and Tan!